There are no available puppies at this time! We are located out of Baltimore, Ohio. About 30 minutes from Columbus, Ohio. We will ALWAYS welcome back any of the puppies from our litters for play-dates or if for some reason you can no longer care for your mastiff, we will welcome them back no questions asked. I love all the puppies from my litters and if I could keep all of them I probably would. I also love to keep in contact with the owners of the puppies from my litters as well, just to see how they are doing. 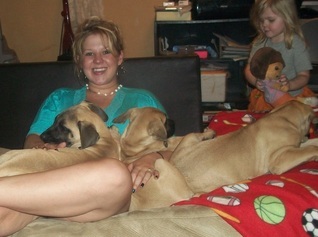 If you are considering an English Mastiff puppy and are worried because you don't have large breed experience or are just plain nervous, don't worry. 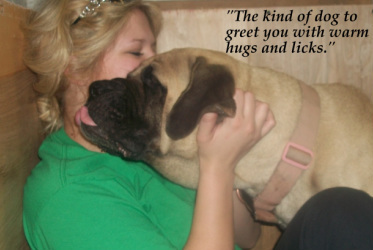 I am here to give advice to help with anything that I can possibly help with when it comes to your mastiff. Our goal is creating show quality-champion bloodlines puppies by enhancing qualities in looks, health, temperament, etc. but also eliminating qualities that are not favored in this breed through the selection of our Dam and Sire. Click Here to Fill out your Puppy Application Today!!! "Bark With The Big Dogs, Or Get off The Porch."